Walking down the curving hill of Warwick Road from the Duke of York public house on the corner, one passes Upton Place on the right, a relatively recent curling road with housws fitting into the spaces behind the Victorian housing. Towards the cul-de-sac, on sees a 'rear' entrance to 'Home Cottage 1889'. Similar vintage (1970s?) houses are seen on either side of the Upton Place entrance on Warwick Road. 'York Road' – did it really exist? Below these on the western side of Warwick Road stands a detached house which is twisted at an angle to the building line of the houses around it: number 35. On a detail of White's map of Ipswich dated 1867 (the larger section is shown with annotations on our page about Belle Vue Road (and Belle Vue Retreat), a short street running roughly east-west is shown running between the upper part of Palmerston Road and Warwick Road labelled 'York Road'. This would be a logical name given its proximity to the Duke of York pub. The open area to the south on the detail is labelled 'Freehold Land Society'. This area was amongst the first to be developed for housing by the Ipswich & Suffolk Freehold Land Society (F.L.S.). The first structures were 'workman's houses' in nearby Lancaster Road and it may be significant that the later – and much larger – Rose Hill F.L.S. estate (January 1870) included the 'York Road' which we see today running between Felixstowe Road and Upper Cavendish Street. 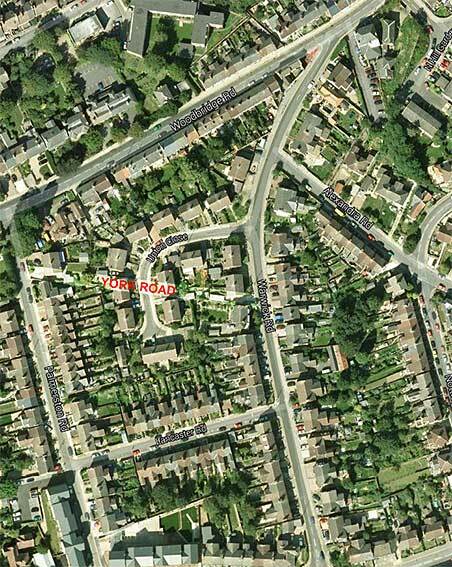 See our Rosehill house names page for more on York Road and environs. Perhaps post-Rose Hill Estate, this York Road was built over to avoid confusion. So, back to number 35. At first we assumed that this York Road had run slightly to the north, the western end having been closed off by 20th century (1960s?) housing which one sees today, the eastern end still used as part of Upton Place. The only way to confirm this was to compare maps. The house isn't present on the 1867 map detail – confirmed by the date '1880' on the house fabric shown below. This very specific date is unusual to be set in stone on a house, although a single day does also appear on Primrose Terrace plaque in Ranelagh Road. And do the initials refer to a company, or individuals who first lived in the house, or the builder? Below: the 1867 detail turned red and overlaid over the current aerial view – not an exact fit, but close enough. Taking the angle from no. 35 Warwick Road and drawing it back westwards to the 1970s houses (nos. 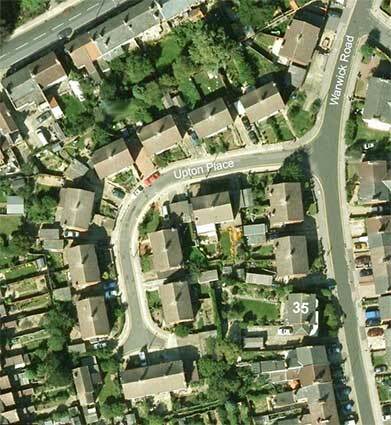 48-50), which are set back from the Victorian building line in Palmerston Road, shown as a pale line on the aerial view, seems to confirms this theory. 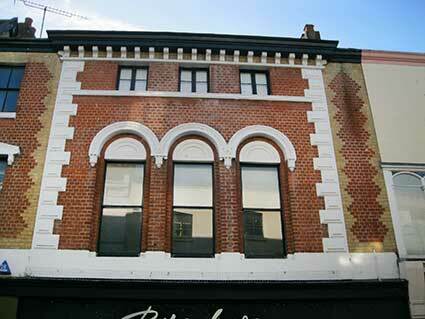 The building on the east corner of Palmerston Road is 170 Woodbridge Road, marked on maps here as 'Rywick Lodge'[? ], but Bettley: Suffolk- East Pevsner (see Reading List) lists it as a red and white brick Italianate villa, 'The Casino', built for himself by the architect of the Custom House on the Wet Dock, J.M. Clark, in 1845-6 (scroll down for information). It seems that the actions of a later owner of the garden of The Casino, A. S. Vanden Bergh, had an important effect on the developement of housing to the south – see the F.L.S. maps below. By the 1883 map (above) 'York Road' is not shown, but a boundary between Palmerston and Warwick Roads follows the same (or similar) line down to No. 35. Upton Lodge can be seen, angled parallel to Woodbridge Road, north of No. 35. One does begin to wonder if York Road was planned, but never actually built. 'Yes you're right about FLS connection with York Road (the one off Warwick Road!) 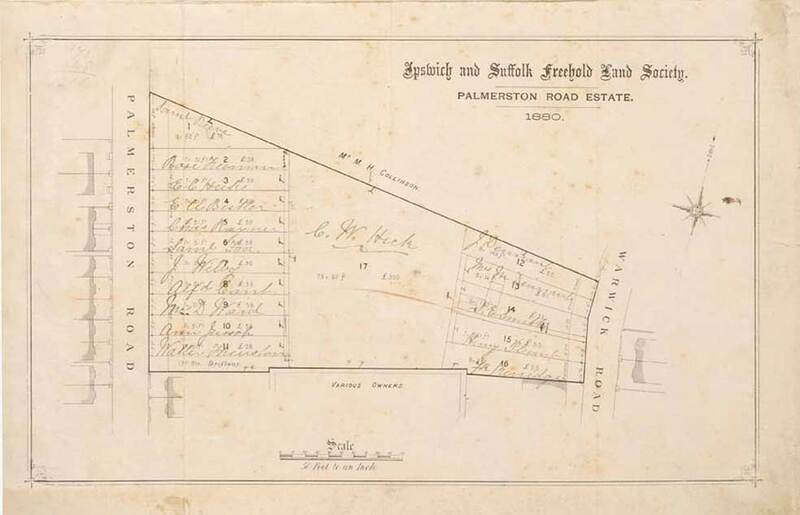 It's shown on the 1866 FLS St Helens Estate Plan (Ref: GF419/FLS/3/2/2/2). 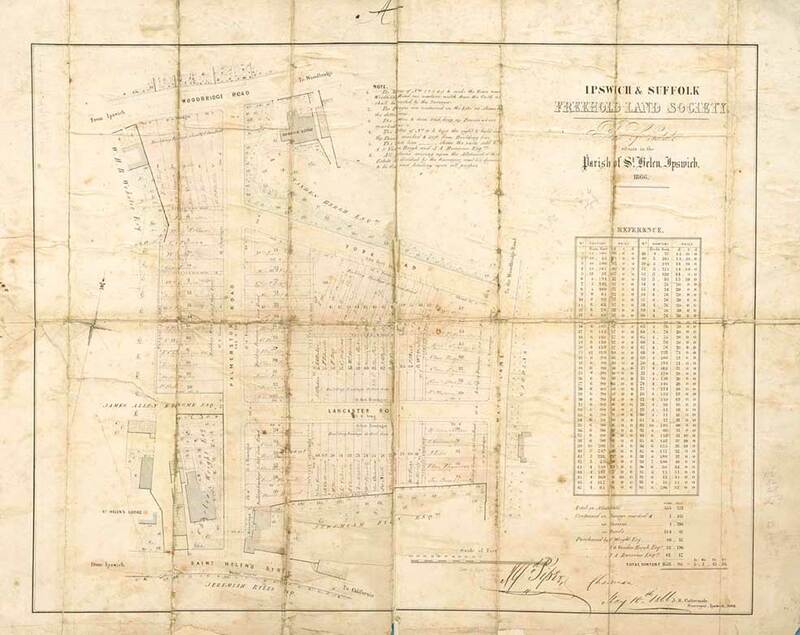 'We are pleased to provide the attached image of our 1866 plan as requested and would be happy for you to use it on your website if you wish. We are very grateful to the Ipswich Building Society for permission to include these conclusive maps. 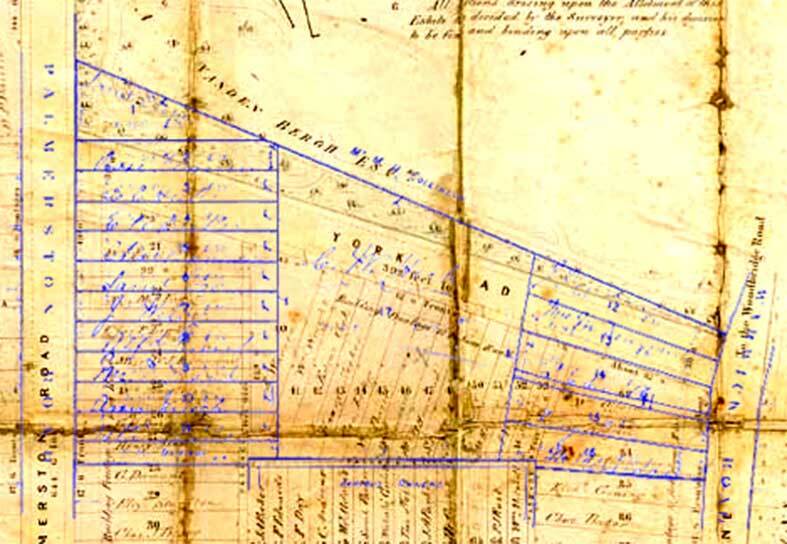 Placing the 1880 detail ('The Palmerston Road Estate' – in blue) over the 'St Helens Estate' plan shows a number of variations in the perimeter of this modestly-sized plot. However, the angle at the passageway between plots 14 and 15 (in blue, which can still be seen as the driveway of number 35) matches that of the proposed York Road. It would appear that in 1880 additional plots (12 and 13) were planned. It is possible that 13 and 14 were purchased and no. 35 Warwick Road built on them, as the house is bigger. The central area (F.L.S. ballot-winner, C.W. Hick) remained undeveloped until Upton Place was built, probably in the 1960s. "I lived in Harmony Square until 1943 with my parents and two brothers, Peter and Arthur. Enemy aircraft were frequently over the town and broken nights sleep were a feature of daily life. On the night of August 25, 1942 the raiders were met by particularly heavy anti-aircraft fire which almost certainly forced one of the planes to drop two 500kg high explosive bombs. 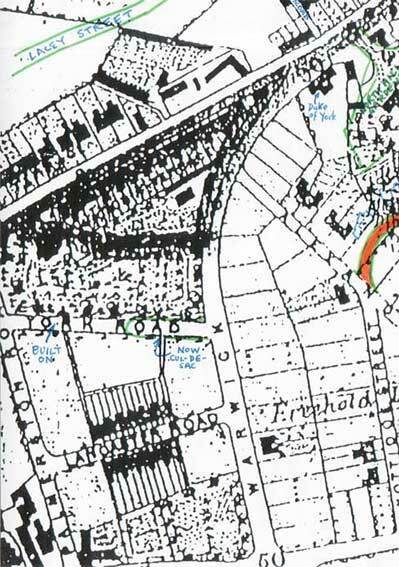 The first of these fell in the wooded grounds of Derby Lodge [shown in green on the 1883 map on our Belle Vue Road page and the site of today's North Hill Gardens], next to the Duke of York public house at the junction of Woodbridge Road and Warwick Road. The bomb failed to explode and was removed from beneath a beech tree by a bomb disposal unit some five days later. The second bomb punctured the rear roof of the nearby Mission Rooms [in Harmony Square] and passed through the building and out through the ground floor window, where it buried itself in the soft earth.At the time, my parents, my brother and I, together with an elderly neighbour, were bundled together in a Morrison shelter , which occupied almost the whole of the front room! After waiting for the debris and dust to settle and on the assumption that the bomb had exploded we ventured out, together with the neighbours, to provide any assistance necessary to the occupants of the Mission Rooms. To our amazement an elderly couple – a Boer War veteran and a lady who was deaf and dumb, were sleeping downstairs, had a miraculous escape and were unhurt. The bomb must have passed immediately over them. Having found out that there was nobody injured, neighbours returned to their homes only to be only to be advised by the police and air raid wardens to evacuate our homes shortly afterwards, we had been standing on an unexploded bomb! We were taken to a large house on Woodbridge Road prior to being taken by bus to Holywells Park mansion, which was used as a rest centre. We stayed the night and the next day found temporary accomodation with friends. Eventually on August 30 we returned home and I recall the defused bomb being rolled away before being taken away in a lorry for disposal. 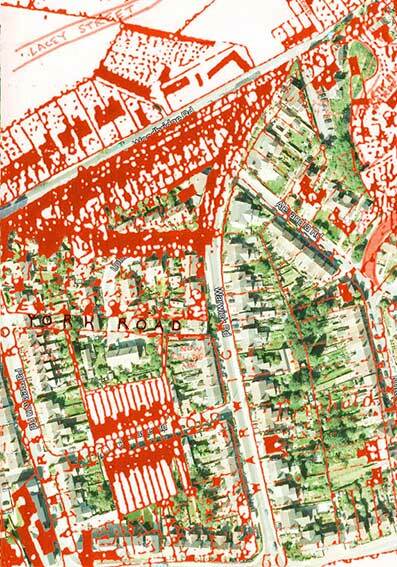 Fortunately the bomb had caused no casualties and limited damage to property – several houses had previously been been damaged when the mine exploded in Cemetery Road in September 1940. Tragically on the same night as the above incident, a house at the junction of Nacton Road and Lindbergh Road was demolished by a bomb that killed a mother and eight children – such is the luck of the draw in wartime! The 'square' consisted of two mews of small terraced houses standing opposite each other and separated by thin front gardens and an unmade area, used by children as a play area. At one end of the square stood a large building occupied by Whitfield King Stamp Company which had access from Lacey Street and at the other end and backing on to the houses on Woodbridge Road stood the Mission Rooms – a two-storey building providing accomodation for the elderly. Harmony Square no longer exists – it was demolished in the late 1950s and is now the site of old people's accomodation, Hanover Court." Another story is that in 1880 no. 35 was built as a parsonage for St Helen's Church. However, we see from the map on our Palmerston Road page that a large house labelled clearly 'Rectory' once stood north of St Helen's Church, fronting Woodbridge Road – the space which is now the entrance to St Helen's Primary School. Presumably, the church would not have needed a parsonage. In addition, a rectory is used for administrative purposes (often also as lodgings for visiting church officials) and is traditionally built close to the church to which it is associated. See the point 1 in the Update below. [UPDATE 4.12.2016: "Hello Borin, Thank you for the note you popped through the door. And for the research work you’ve done on your website. I have a couple of snippets of info which might be helpful. 1. 35 did used to be a parsonage. St Edmundsbury Diocese. 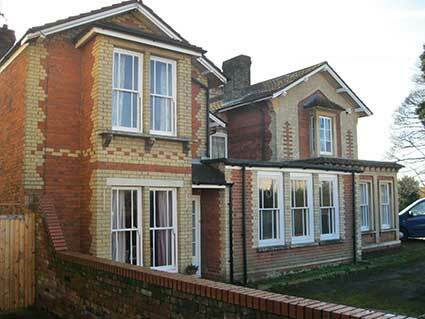 But they bought no 35 in 1982, so it was not a purpose built parsonage / rectory. But it has been a parsonage for a short while. 2. The names on the stone, “RE and SC”: I have a theory. 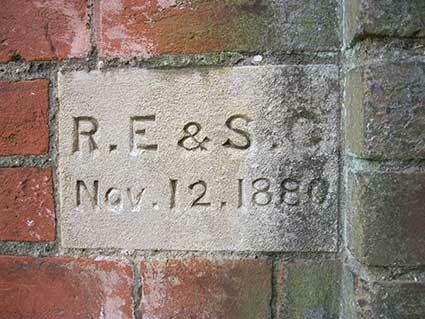 I think they actually say “RE & SG” but the stonework has become indistinct over time. Why? In 1880 the land no. 35 stands upon was sold as a plot, implying any previous building was pulled down by then. It was sold to a Richard E Gower. If he had a wife / son / other family member then this would make sense: If I paid to have a house built, I’d want my name on the plaque. I’ve also heard a theory about the missing no. 37: Originally the plot was going to have two houses built upon it. The numbering of neighbouring houses took this plan into account. Then the plan changed and a bigger single house was built. I hope these snippets help you. 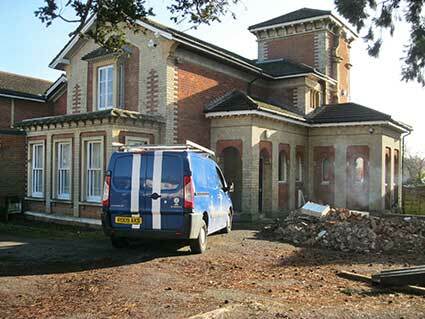 Jeremy Foster"
The house, now divided into flats during clearance of the car park and possible interior works in 2018. Around 1980 it acted as the headquarters of St John Ambulance. "The Casino, a hitherto unsuspected work by [John Medland] Clark, designed, built and used by him as his residence in 1845 and 1846, still exists today, now known as 170 Woodbridge Road, standing as then 'on an eminence ... within ten minutes walk of the centre of the flourishing and rapidly increasing town of Ipswich’. The 'unrivalled views of the picturesque Orwell' which it had then, have unfortunately been obscured. Correlation of evidence from many sources leads us through its change of name from The Casino, to James Cottage, to Rhynwick Lodge, to plain 170 Woodbridge Road, and though some structural alterations and additions have been made in the intervening years, it is still very much the house that Clark designed —the polychromy of white and red brick, the Tuscan style of overhanging eaves, used to such effect on the Custom House, the turret, reflecting the campanile on that same building." Ruth Serjeant's article continues: "Clark's work runs the gamut of all these influences and trends — Neo-Classicism and Jacobean in the Christ's Hospital School; polychromy, both 'constructional' and 'flat' in the Custom House, with a combination of styles here from Tuscan classical, French Revolutionary, to domestic villa architecture in the Italian style. He reproduced, on a much smaller scale, these particular themes and variations on the facade we can see today over Dixon's photographic shop at 24 Tavern Street, which is the 'Mr Meadows' shop' referred to in his obituary. The Meadows business of ironmongery and furnishing moved to its new premises at this address in 1844. To advertise an enlargement to the shop area twenty years later, an engraving of the facade was printed. It is readily identifiable; little has changed. What was so novel with this little building, as with the Custom House, was the marrying of the polychromy technique with an essentially Classical or Neo-Classical style. Hitherto, such buildings in East Anglia, as in London, had been built in 'white' brick, used, strictly speaking, as a substitute for the more expensive white stone. Red brick was considered unsuitable and even 'common' for such styles. But here we have, quite early in its conception, the technique of using red brick, executed in an extremely pleasing and decorative way." Clark died there at the early age of thirty-six, and yet he seems, in only nine years of residence, to have made an important and fresh impact on Ipswich. We have had sight of this remarkable document from 1913 describing bequests and charitable gifts to St Clement Church dating back to 1584. Thanks to Bob Allen for lending us the document. ‘THE PROPERTY belonging to this Charity now consists of the House situate on the South side of the Woodbridge Road Ipswich known as “Rhynwick Lodge” and of nineteen other houses near thereto and adjoining each other and respectively numbered 172, 174, 174a, 176, 178, 180, 182, 184, 186, 188, 190, 194, 196, 198, 200, 202, 204 and 206 Woodbridge Road and of a house situate on the North West side of Warwick Road and of a house situate on the North West side of Warwick Road Ipswich known as “Upton Lodge” and now in the occupation of Guy Bantoft. A piece of landed as garden ground lying on the South side of the garden belonging to Rhynwick Lodge and abutting towards the east on Warwick Road. The Woodbridge Road block of properties is continuous from east of Rhynwick Lodge right up to and including today’s Capelli hairdressers shop. This includes the string of houses labelled ‘Victoria Terrace’ in the 1883 map: numbers 176 to 206; there is no name plaque on the facade to indicate this name and, one assumes, it has long been forgotten. In 1913 all these houses were owned, effectively by the Parish of St Clement. 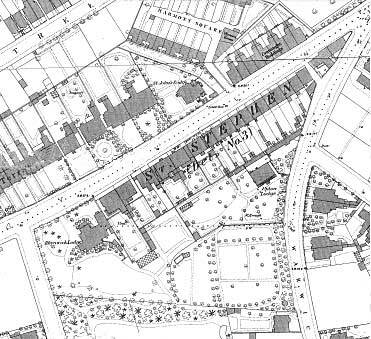 Upton Lodge appears on the 1883 and 1902 maps of the area below and parallel with the rear gardens of the row of houses on the south side of Woodbridge Road, ‘Victoria Terrace’ (close to the site of today’s 47/49 Warwick Road). 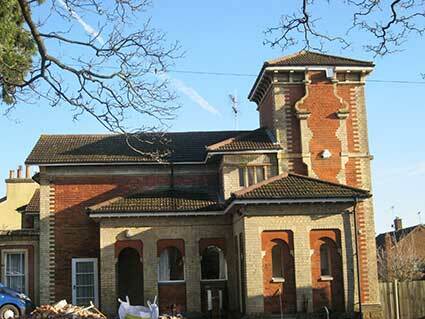 It is only a hundred yards or so from Rhynwick Lodge, later James Cottage, The Casino and today 170 Woodbridge Road. This takes us back to a time when houses were known by names rather than house numbers. The Uniform Penny Post was introduced by The General Post Office in 1840 and postmen would have known their rounds by house name and probably occupant name. House numbering sprang from the growth in housing density and the need to identify specific addresses more logically. Houses were numbered consecutively from the end of a road nearest to the local post office or sub-post office, which would have made the round more logical for postal deliveries. The art of house numbering at this time must have been challenging when houses were erected piecemeal and parcels of land for each house might change over time. Sometimes we still come across anomalies. Belle Vue Road, because it was developed in at least two stages, starts at the bottom of the hill with number 17 on the left and number 6 further up the road – after the depth of 21-23 Alexandra Road’s back gardens – on the right. Furthermore, there is a jump from 111 to 115, perhaps due to a triangular plot as the road turns opposite Post Mill Close, and 117 continues to 1980s-built houses 121 and 123; the ’119’ presumably being left because it is occupied by a 19th century timber-built chaise house once serving Fernside (1850) 288 Woodbridge Road, on the corner. So these problems are still being addressed by those who plan and number new housing. See also Tooley's and Smart's Almshouses for more J.M. Clark designs.